Accounts of the day's riots in Greece, including the torching of a government ministry. -Clashes at this time in Exarhia. Molotov attacks a while ago at the police station of the area. The police pushed away the protesters with chemicals. I was for a while down the street but had to come back, I cannot breath properly. People have got out of their houses and activelly tried with the comrades and pushed back the police down to Xar Trikoupi str, far from the square. There were also problems at Stournara str near the Polytechnic but it was not possible for me to approach. I think I will log off and try to get to the polytechnic from Patission entrace. I am in Athens since earlier today. I was in Syntagma sq as well, Stella reported quite enough of what was happening there. I am in Exarchia now, the situation here is CHAOTIC. I had to leave from the streets because of breathing problems. There was an attack of 1000 comrades against the police station of Exarchia. We met at the alley that Alexis was murdered and then headed down for the police department. Chaos was created, road blocks exist all over the place in Exarchia and riots against the police continue now. 21:31 Around 300 anarchists attack the offices of the Ministry of Planning and Public Works in solidarity with the struggle of the people of the village of Leukimi in Corfu (a local woman was assassinated by the police there in the summer). Two banks are also smashed and burnt. High street shops are smashed. The police are nowhere to be seen. Thousands of people have gathered at the point of assassination of Alexandros (at the corner of Messologiou and Tzavella Street in Eksarhia) and a demonstration is about to begin. Last night, I met a friend of Alexandros’ who was sitting close to him when he was assassinated. Standing there silently, listening to him describe the moments of the assassination (for the n-th time I imagine) I couldn’t help but think: How many years did this kid grow over these seven days? Listening to him explain exactly how the cop is now attempting to cover up the story, how the ricocheting scenario can’t possibly stand… Seeing him argue how we need to change our tactics to take our struggle forward. Joking with us about the incapacity of the indymedia servers to hold the incoming traffic in the first days of the revolt. How many years did he grow? I can’t help but think; they took 15 years from Alexandros, but years and years of life were transplanted into all of us who are here now. In these days of revolt, normalilty and normal time have been suspended - finally giving us ample time in which to live and grow. For this reason, as for a million others, there is simply no way back now: time can’t move backward, what we have lived cannot be unlived. “Remember this”, I heard the old man telling his grandson at the spontaneous mural for Alexandros at the spot of his assasination. “Remember that it is always authority killing the people, it is always the powerful who kill the powerless”. The kid will never forget this week, none of us will. This is the longest week of our lives. Saturday, 5 pm. Four hours before a full week from the assassination. We are preparing to take the streets again. This night, too, is your night Alexandros. 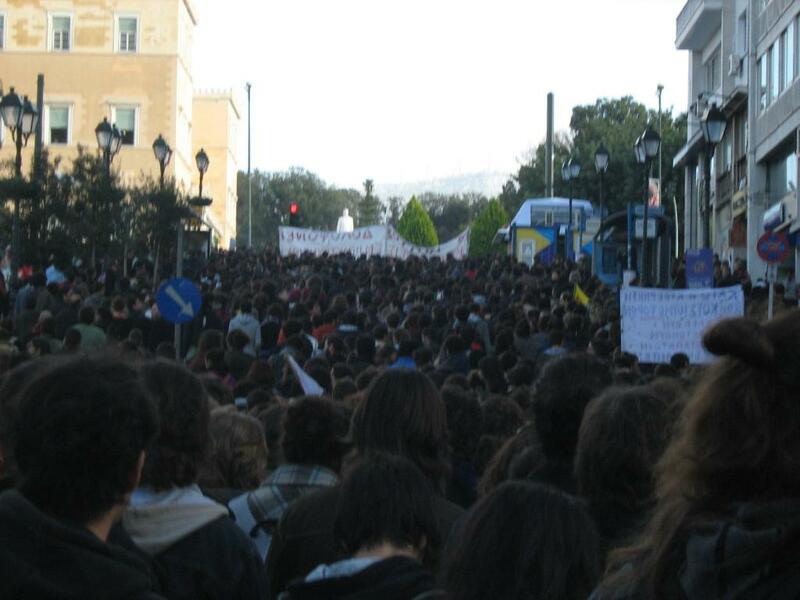 Today (Friday), the assembly of the occupied Athens Polytechnic decided to make a callout for European and global-wide actions of resistance in the memory of all assassinated youth, migrants and all those who were struggling against the lackeys of the state. Carlo Juliani; the French suburb youths; Alexandros Grigoropoulos and the countless others, all around the world. Our lives do not belong to the states and their assassins! The memory of the assassinated brothers and sisters, friends and comrades stays alive through our struggles! We do not forget our brothers and sisters, we do not forgive their murderers. Please translate and spread around this message for a common day of coordinated actions of resistance in as many places around the world as possible.